A male Ruby-throated Hummingbird stopped at a bird feeder this morning, August 29th. I feel pretty sure that this is a migrating male since the feeders that my resident male guarded all summer have, for the last few days, been unguarded and available for young and female hummingbirds. Have you ever thought about what you'd ask a bird if you could (and if they could answer)?? Things that scientists just can't tell us about an individual bird in our yard? 1) Where did you spend your summer? 3) When did you leave your territory and what stops did you make before arriving here? 4) Did you stop here last fall too? 5) Are you finding everything you need in my yard habitat? 6) How long will you stay here and when do you hope to hit the coast? 7) How many stops will you make along the way and will you try to stop at the same places as last year? Where are they? 8) What is it like to fly across the Gulf of Mexico without stopping? 9) Where will you spend the winter and how is the habitat faring there? 10) Do you spend any time there in a shade-grown coffee farm and can you describe the habitat in a shade coffee farm compared to a sun coffee farm? Wouldn't you love to know the answers? Is there anything you'd like me to ask him if I can pin him down? A couple months ago, my sister gave me a used Keurig® brand coffee maker. These coffee machines have intrigued me for years but three things kept me from investing in one. First and most importantly, I have committed to drink only Smithsonian Migratory Bird Center certified Bird-friendly® coffee whenever I can. Bird-friendly coffee is shade-grown coffee that has earned certification by the Smithsonian Migratory Bird Center because the manner in which it is grown helps protect and preserve the winter habitats of many migratory birds. My bird-friendly coffee of choice is Birds & Beans™ coffee, which we sell at Wild Birds Unlimited - Saratoga Springs NY. I love the Chestnut-sided Warbler roast, but it is not available in a K-cup, nor is any other certified Bird-friendly coffee that I'm aware of. My second reason for avoiding the Keurig system is the tremendous waste involved. Every single cup of coffee, tea, or hot chocolate brewed using a K-cup in a Keurig machine adds a plastic cup, liner, and foil cover to the landfill. The cups are NOT recyclable plastic and are not biodegradable. Back in 2010, a NY Times article stated that Keurig "expects to sell nearly three billion K-Cups, the plastic and tinfoil pods that are made to be thrown away — filter, grounds and all — after one use." That's 3,000,000,000 little cups going into landfills each year, and I bet that number is growing as the popularity of the machines grow! The Keurig "My K-CUP®" Saves the Day! There is an accessory you can purchase for your Keurig maker (except the new Vue model) that lets you "use your own gourmet coffee" in your Keurig machine. It's a 3-piece unit composing of a filter, holder, and lid. To use it, you remove the filter basket of the machine (the part with the needle that punctures the cup) and insert the My K-cup that has been filled with (preferably) Bird-friendly coffee. Brew as regular. When done, you're able to compost the grounds, then wash the unit before the next use. I have two of them at home so one is always clean. The cost of a cup of Bird-friendly Birds & Beans coffee using the My K-Cup is just 37 cents per cup. You get almost 2 full cups of delicious shade-grown coffee for every 1 cup made from a pre-filled plastic cartridge. Don't add to the THREE BILLION cups being added to the landfill each year!! Though you can compost the grounds in a pre-filled K-cup, most people do not. Drinking certified Bird-friendly coffee in your machine will help preserve the habitat of many migratory birds. Look for The My K-cup accessory where you buy Keurig machines. Right now at Wild Birds Unlimited - Saratoga Springs, we have a limited number available for purchase. And next spring, when you see the brilliant orange & black of the Baltimore Oriole or hear the ethereal song of the Wood Thrush you can be proud that you have taken a step to help their survival. Please take a moment and think about this and join me in brewing Birds & Beans coffee using a My K-cup accessory in your Keurig brewer. Rose-breasted Grosbeaks are easy to attract to your birdfeeders because they like a wide variety of seed and are comfortable at many types of birdfeeders. Rose-breasted Grosbeaks prefer black-oil sunflower, safflower, and striped sunflower. A perfect blend for them is Wild Birds Unlimited Supreme Blend. Grosbeaks in our yard also love seed cylinders and stackables. You seldom see grosbeaks at suet feeders but we have seen them take a nip of Bark Butter now and then. Lately, I've seen them enjoying peanuts too! Grosbeaks eat from a variety of elevated feeders including hopper feeders, tray feeders, and tube feeders. They'll visit feeders that hold our seed cylinders and we've had them visit window feeders as well. The feeder should have a perch since grosbeaks are not clinging birds. They seldom eat on the ground. Put out a source of fresh water for your birds and you might enjoy seeing grosbeaks drinking or bathing in the water you provide. Rose-breasted Grosbeaks are here only during the breeding season. The other months of the year, they thrive in the habitat provided by shade-grown coffee farms. Sun-grown coffee plantations lack the habitat for these gorgeous birds so the type of coffee you drink can made a difference to the grosbeaks. Drink certified Bird-friendly® shade-grown coffee like Birds & Beans® to help ensure that these beauties return to your yard year after year. - In February, the Associated Press contacted us for an interview about the upcoming Great Backyard Bird Count. We welcomed AP writer Mary Esch and AP photographer Tim Roske to our home, where we watched and talked about birds over some Bird-friendly® coffee and warm scones. The resultant AP story with our quote and pictures of our birds at feeders showed up online at the Wall Street Journal, Huffington Post, NPR, Albany Times Union as well as dozens of other news organizations, print and online, all across the country. - One week later, our 24-hour news network YNN visited our home for another interview about the Great Backyard Bird Count. We were thrilled with a nice 1-1/2 minute piece encouraging participation in the count. It ran locally, but also in Ithaca and one customer saw it in Rochester! - We stirred up enough local interest in the Great Backyard Bird Count that Saratoga Springs ended up #4 in NY state with 73 checklists submitted and Gansevoort was #8 with 47 checklists submitted. Here's a list of all localities in NY that had checklists submitted. - We were honored to be asked to be an Official Blogger at September's Midwest Birding Symposium. Our posts highlighted symposium speakers wildlife photographer Marie Read, Ben Lizdas of Eagle Optics, and the Birdcall Lady Nicolle Peretta and told of the Guinness World Record we set imitating a Barred Owl call. - We were thrilled (and just a little nervous, to be honest) to be asked to write the Cover Species article about the Common Redpoll for the November/December 2011 issue of BirdWatcher's Digest. Here's a link to an excerpt from our Species Profile of the Common Redpoll. - At the invitation of local birding expert Rich Guthrie, Nancy was a guest on the Northeast Public Radio WAMC Vox Pop call-in radio program on December 7. Here's a link to listen to the show. - On December 11, international birder Richard Crossley visited our store to sign copies of his revolutionary book, The Crossley ID Guide. WBU customers Paul Pacco, Lindsey Duval, and Robin Laurenzo bought their guide at WBU and won the opportunity to have lunch with Richard. - We've always taken our responsibility to the community seriously. This fall, we turned our focus to the Franklin Community Center Food pantry. We and our customers are fortunate to have the resources to feed the birds; many people in our area have trouble finding the resources to just feed themselves. In October, we hosted a "Garage Sale" selling used, repaired, swapped, and donated feeders and gave 100% of the proceeds, $273, to the Food Pantry. We also hosted a food drive during our Open House in December. We gave a Birdseed Bell to anyone who donated a non-perishable food item. 33 customers donated food, and we were able to deliver 130 pounds of food to the Food Pantry. - All in all we had a good year; not our best as far as sales are concerned, and we're always striving to improve. 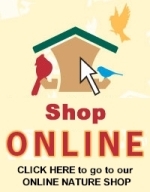 We love what our little shop does: we help thousands of people enhance their enjoyment of the birdfeeding hobby. How great is that for a "job"??? And last year, we had nearly 900 new customers through our doors - we're so excited to introduce new people to this wonderful hobby! For 2012, we're looking forward to more fun, adventures, experiences, and discoveries. We already have a new product in line to introduce to you early in 2012 (we're teasing you with a picture clip of it below!) We wish you a year of magical birdfeeding! It's Winter - Do You Know Where Your Summer Birds Are? It's mid-winter in the northeast and our lawns are covered with about two feet of snow. Winter flocks of chickadees, nuthatches, titmice, woodpeckers and jays visit our feeders to help them survive the long winter nights. These are our resident birds, birds tough enough to withstand the cold and whose diet is flexible enough to subsist on the seeds, nuts, and other foods available in sub-freezing temperatures and snow-covered landscapes. But where are the birds that call our yards home during the summer months? Birds like Ruby-throated Hummingbirds that need a steady diet of nectar and insects and spiders? Or the Baltimore Orioles that feast on caterpillars and other insects high in the treetops? Where are our summer yard birds right now? A mid-distance migrant, our hummingbirds' migratory flight could have taken them to Mexico or Central America as far as Costa Rica. These mid- to long-distance migrants fly south in the winter to Mexico as well as central and South America. A mid- to long-distance migrant, orioles are spending their winter in Mexico or perhaps central or South America. Another mid- to long-distant migrant, buntings may be found in winter in Mexico, central America and northern South America. These birds don't go too far! They're short-distance migrants that travel to areas just south of the frost line, areas that have an average minimum temperatures of 25 degrees F.
Chippies are another short-distance migrant, wintering in the southern US. The cat-mimic is a short- to mid-distance migrant that winters in the southern US or as far south as Panama and the West Indies. This catbird is one I saw in Florida during March 2009. These early spring migrants don't have a real long trip. They are short- to mid-distance migrants that winter in the southern US or as far south as central America and the Caribbean. A short- to mid-distance migrant, sapsuckers winter in the southern US, as well as central America and Caribbean. In mid-winter and it's easy to push the well-being of these birds to the back of our mind. Out of sight - out of mind. Yet a number of these favorite summer birds are right this moment enjoying the diverse and forested habitat provided by shade-grown coffee farms. Or maybe not. Perhaps that habitat has been destroyed in order to produce sun-grown coffee, so it can grow faster and cheaper. All year long you can act to help protect their winter homes by asking for and drinking only a Bird-friendly® shade-grown coffee like Birds & Beans™. Birds & Beans gets its beans only from shade-grown coffee farms that have been certified by the Smithsonian Migratory Bird Center as having the highest quality habitat for the birds, thus earning the coffee the Bird-friendly certification for all its blends. Have a cup for the birds. You can find Birds & Beans at Wild Birds Unlimited - Saratoga Springs NY, many other WBU shops in US and Canada, and online. - As mentioned in our Year in Review 2009, an unprecented drop in bird activity that started in September 2009 continued through the early months of 2010. The nesting season helped feeders get busy again and we heard many good reports of Rose-breasted Grosbeaks (first time in yard reports), Indigo Buntings (at feeders all summer), woodpeckers and Carolina Wrens (busy at feeders), and hummingbirds (outrageous activity in August). Feeder activity as I write this is normal to slightly-below-normal as we await the widespread arrival of Common Redpolls. - We attended the Saratoga Springs Rotary Home & Garden Show for the 6th year. We'll return to our old booth G1 in the new City Center for this year's show February 25-27, 2011. - Saratoga Springs residents submitted 61 checklists to the 2010 Great Backyard Bird Count, 7th highest in the entire state. Surrounding cities and towns also had respectable counts. 46 local checklists were submitted by WBU-Saratoga Springs customers. - In June, we had a collection box and held a garage sale to benefit the International Bird Rescue Research Center. This organization was a leader in recovering birds impacted by the Gulf oil spill. With our personal contribution added in, we were able to donate $500 to adopt a pelican on behalf of the Customers of Wild Birds Unlimited - Saratoga Springs NY to support IBRRC's efforts around the globe. - We pledged a portion of store sales over our Anniversary Weekend in August to benefit our local wildlife rehabilitators, North Country Wild Care. Lois and Peg presented a $300 check to the organization at their September fundraiser. - For the 3rd year, we were a major sponsor of the Great Adirondack Birding Celebration held at Paul Smith's Visitor Interpretive Center. Despite changes at the VIC due to budget cuts, the GABC will go on June 3-5, 2011 - try to attend and look for us there! - In November, we welcomed Lillian and Don Stokes to our store to sign copies of their new field guide. People came from all over the region to meet and chat with these nationally-recognized authors. Like Kenn Kaufman (who visited in 2009), Don & Lillian honored us with a nice post on their blog. - We continue to be a leader in spreading the message about Bird-Friendly® shade grown coffee by Birds & Beans™. Following our lead (we were the first Wild Birds Unlimited shop in the country to carry Birds & Beans coffee), over 40 WBU shops in the US and Canada now carry it for their customers. - We are a leader on the internet amongst all WBU stores. Over 300 customers "LIKE" us on Facebook and many follow us our Zen Birdfeeder blog and Twitter. 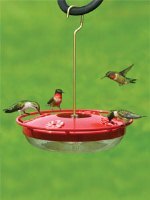 - Everyone loves new products for the birds, and in 2010 we introduced two great lines: EcoClean™ feeders featuring antimicrobial product protection and our line of Birdacious birdfood including Nutty for Nuts and Bug Berry Blends and Stackables. And (News Flash) watch for a new Bark Butter product in early 2011!! Looking back gives us a chance to say THANK YOU to all of you who frequent our little shop. In doing so, you have helped us succeed and have made Wild Birds Unlimited - Saratoga Springs NY one of the best little birdfeeding hobby shops in the whole country! As much as I keep track of the arrival and departure dates of hummingbirds, I never really stopped to figure out the length of time hummingbirds are present in my yard and how long they're in their winter home. What I found surprised me. This is just a bit over 4 months (most of May, all of June, July, and August, and a little bit of August). So the rest of the year - 8 months - they're either in migration mode or at their winter homes in Central America or Mexico. On the way north in the spring, hummingbirds take 2-3 months to make the 2000+ mile trek. And on their way south, by the end of October, most have left the U.S., so fall migration likely takes 2-3 months as well. That means that they are on their wintering grounds for about 3 months - and then they start the whole cycle again! During those 3 months, Ruby-throated Hummingbirds are known to utilize the rainforest-like tree canopy found in shade-grown coffee farms. Sun-grown coffee, like most commercially-produced coffee, poses a threat to the future of shade-grown coffee farms and thus to the winter habitat of our hummingbirds and other neotropical migrants. You can help protect the winter habitat of our hummingbirds by making the decision to drink only a certified Bird Friendly® shade-grown coffee like Birds & Beans™. Birds & Beans is available at Wild Birds Unlimited - Saratoga Springs NY and online. Approximately 237 days, about 8 months from now. August - The Best Time for Hummingbirds! In the world of hummingbird lovers who live in the northeast, May is always exciting. For weeks, the excitement builds as we anticipate their arrival, and upon sighting the first returning males, we marvel at the miracle of migration. But I have to vote for August as the best time for Ruby-throated Hummingbirds in upstate New York. After a lull at the feeders as nesting progresses from late May through July, the hummingbird population just explodes when the young fledge in late July/early August. Just think - there are many million more hummingbirds in the world this month than there were in May! What an amazing thought! Young hummers sport fresh feathers and look chubby from all of mom's tender loving care. They emerge from the nest just as big as adults. And they are quick to join in the fray at the hummingbird feeders! Mom shows the stress on her body of raising 1-2 kids all on her own. She's skinnier that she was early in the summer and her feathers can look a little roughed up. Adult male hummingbirds can sometimes look a little ragged too, not from helping with the young (which they don't do at all), but from defending their territory. That's what it's all about for males in the summer - safeguarding territory. Resident males will leave any time now, so enjoy the adult males while you can. But don't worry - other adult male migrants may still stop by for a day or two at your feeders before continuing their journey south. Despite all this activity at feeders, it will seem like you're seeing fewer adult male hummingbirds. Well, with roughly 1 adult male to every female and 2 young, you ARE seeing proportionately fewer males that sport a brilliant red gorget. At this time of year, only adult males - not young males - show their namesake ruby throat. The majority of birds you're seeing now look more like the female, with the white throat and belly, white spots on the tips of the outer tail feathers, and a longer, more streamlined body. Admittedly, it's hard to tell mom and young apart at this time of year. If you get a good close-up look, you may be able to pick out a young male by looking for a light striping on their throat (see our Focus on Fledglings post on Ruby-throated Hummingbird young). They might even have a bright red feather or two starting to peek out - just a teaser for the ruby throat to come. It can be frustrating but fun to try to estimate just how many hummingbirds are in your yard. They move so quickly, it's like the old shell game. I try to look for distinguishing characteristics of individual birds (not easy to do), like this young male with a few ruby feathers versus the young male with only a solo ruby feather pictured above. When all else fails, bird banders have given us a way to estimate the number of hummers in our yards: take the number of hummingbirds you can count at any one time and multiply it by 6. That gives you an idea of how many birds are visiting. The last couple weeks, I've been regularly seeing 5-6 individual hummingbirds in the yard - that means that there are 30-36 hummingbirds in my yard! As the month progresses, hummingbirds are bulking up for their long migration. Look for signs of good weight gains on these little guys. Hummingbirds typically weigh about 0.1 to 0.12 ounces; during these pre-migration feeding frenzies, they can bulk up to 0.19 to 0.22 ounces (Source: Wild Bird Guides - Ruby-throated Hummingbird by Robert Sargent). That's like a 150-pound person ballooning up to 275 pounds!! I think I see some good "love handles" developing on this guy! Here's another mind-boggling thought: young hummingbirds, most of them less than 3-months old, will soon begin a migration that will take them from their breeding grounds, south to the Gulf Coast, across the Gulf of Mexico, to their winter homes in Mexico and central America. They do it on their own, not in flocks like many other birds do, and certainly not on the backs of geese, which is an old wives tale that just won't go away. As they depart, take note that Ruby-throated Hummingbirds are amongst the migratory birds that we know benefit from the habitat provided in shade-grown coffee plantations. Please keep this in mind as you choose your coffee, selecting only a certified Bird-Friendly® coffee like Birds & Beans™ coffee. So, enjoy the squabbles at your feeders and keep the feeders clean and filled with fresh nectar. August is a great time to observe hummingbirds in your New York backyard! Before you know it, they'll be gone! Drink Like You Think ~ For the Birds! So you've made the decision to buy a shade-grown specialty coffee. You go to the grocery store and buy a bag labeled "shade-grown". And you feel good because you're doin' the right thing, right? Well...not so fast. Unfortunately, there is no standard for "shade-grown" so the term has been abused. Any coffee grower - ANY - can throw the term on a bag and get away with it. There is no policing of the "shade-grown" claim. So well-meaning consumers world-wide could pick up a bag labeled "shade-grown" but could very well be buying a predominantly sun-grown coffee, perhaps coated with pesticides and other chemicals that help coffee grow - and grow fast - in full sun. But a trusted organization - the Smithsonian Migratory Bird Center - has un-muddied the water by developing a trademarked Bird-Friendly® certification. When you see the Bird-Friendly seal, you can rest assured that the money you THINK is going to buy a specialty "shade-grown" coffee IS truly shade-grown. The Bird-Friendly label means that an independent third-party has certified and verified for you that the coffee is from a producer whose coffee is grown in a manner that provides viable quality habitat for birds. The Bird-Friendly seal also means the coffee is certified organic. The coffee tastes better because shade-coffee beans ripen more slowly, resulting in a richer flavor. Healthy environments for workers and downstream communities. Protecting waterways and sources of drinking water. Eliminating pesticide and chemical fertilizer. If you're reading my blog, most likely you have a passion for the birds. That passion we derive comes with a responsibility to protect the birds. We don't use chemicals in our yard. We keep our cats indoors. We provide food and water for the birds, as well as places of shelter to raise young. Now, take the next step to protect the birds you love: insist on a certified Bird-Friendly® coffee. Become familiar with the BIRD-FRIENDLY SEAL and make sure it is on that bag of shade-grown coffee you're buying! Wild Birds Unlimited - Saratoga Springs NY is proud to carry certified Bird-Friendly Birds & Beans™ coffee. Birds & Beans is also available at a number of other Wild Birds Unlimited shops, through Mass Audubon, and online. More fledglings than I can keep up with! Rose-breasted Grosbeak young showed up on June 22 - well ahead of the last two years! Here's some of my observations and hints on how to identify fledgling rose-breasteds in your yard. Listen for a low-volume, short whine coming from the trees. It sounds like a quiet, mid-pitched "aaahh". Follow adult birds going toward these calls. Notice that these are NOT "itty-bitty birds". In the photo above of the male feeding the young from above, the fledgling has been well fed and looks just as big - if not even chunkier - than the adult! Be sure not to confuse last year's males (born the previous summer) as being this year's young males. Just a reminder that these gorgeous birds that add so much color to our lives are migratory birds, leaving us in the fall to return to their wintering grounds in central America and northern South America. They are known to winter in shade-grown coffee plantations. Be sure your coffee is a certified Bird-Friendly® coffee like Birds&Beans to ensure protection of their winter habitat. Birds&Beans is available at Wild Birds Unlimited - Saratoga Springs NY and at a number of WBU shops across the US and Canada.